It's been an exciting week. The reason I think it's been an exciting week really does make it apparent how much of a geek I am. You see, most people would say it's been an exciting week because of the opening of the 2012 Olympic Games. But I'm saying it because I managed to score the last three characters packs I needed for Fantasy Flight Games' World of Warcraft: The Adventure Game. As I stated in my review, which was posted back in May, this rather enjoyable game originally only shipped with four characters: a gnome hunter, a human mage of some description, an undead ice mage, and an orc warrior. A choice of just four characters in a game that can accommodate up to four players is almost unforgivable: Someone is going to get stuck with that bloody gnome. 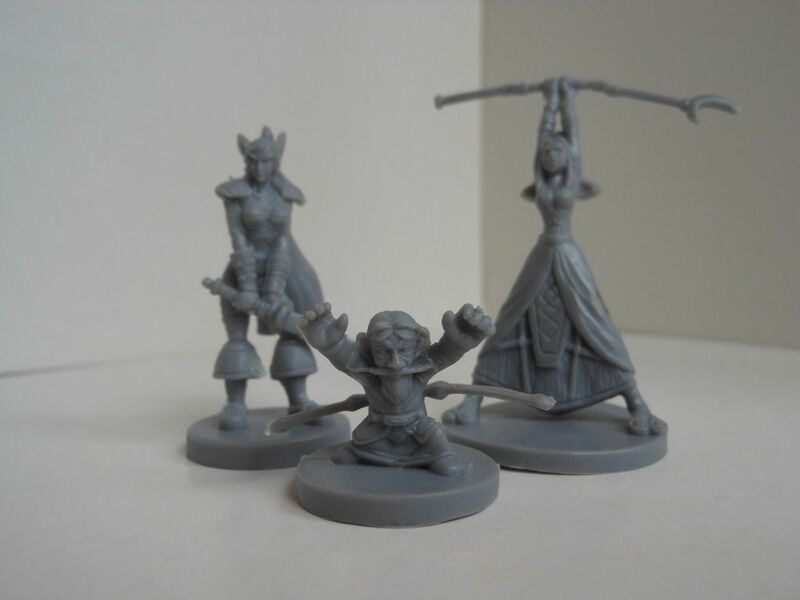 Luckily, the boys and girls at Fantasy Flight Games quickly realised the error of their ways; by which I mean, they soon released character packs containing single characters that were probably ready when the game was launched but which were held back so they could be sold later at a premium. Eight character packs were released in total, before FFG lost the rights to World of Warcraft and the game was discontinued. The characters were released in "waves" of four, and due to diminishing returns, the second "wave" was produced in smaller quantities meaning they are harder to find on the secondary market. I was easily able to pick up the four characters from the first "wave," and a very good friend bought me one of the characters from the second "wave." And now, thanks to ebay, I have managed to pick up the other (rarest) characters. It cost me £15 for the three, almost double what it cost me to buy the entire first "wave," but it means I now have everything that was ever made for this game. So yes, it's been an exciting week. First up is a night elf warrior called Shailara Witherblade. She works in a similar way to the orc warrior from the base set, but where the orc has a regular battle stance and a berserker stance that makes him give up armour in exchange for a more powerful attack, Shailara has a regular battle stance and a defensive stance that gives her extra armour in exchange for a weaker attack. Basically, she is the opposite of the orc. Interestingly, one of the things that defined the orc warrior was a range of "shout" special powers. Shailara only has a single "shout" card in her deck of special actions, so she should feel different enough to the orc to make her inclusion in the game worthwhile. Brebo Bigshot is the second gnome character in the game. He is a fire mage, so is the polar opposite of the ice mage from the base set. He looks pretty interesting; but with lots of special abilities that involve setting fire to stuff, he doesn't look particularly subtle. I'm not sure there is going to be much in the way of strategy with this guy. Probably the most interesting character is Wennu Bloodsinger, a troll priestess who has the ability to adopt a shadowform that allows her to recover wounds. What makes this ability interesting is that she gets to heal one damage when she plays a card with the keyword "shadow." As there are several "shadow" combat cards, she is one of the few characters who can go into a combat injured, and come out healed. This means she doesn't need to play as cautiously as some characters, and can plough on regardless of the damage she is soaking up. But I know what you're thinking. You didn't come to my blog to hear about cool expansions to fun, modern games. You want to hear about random crap I've picked up in charity shops. Well you are in for a treat, because I have found something completely random and entirely crap. 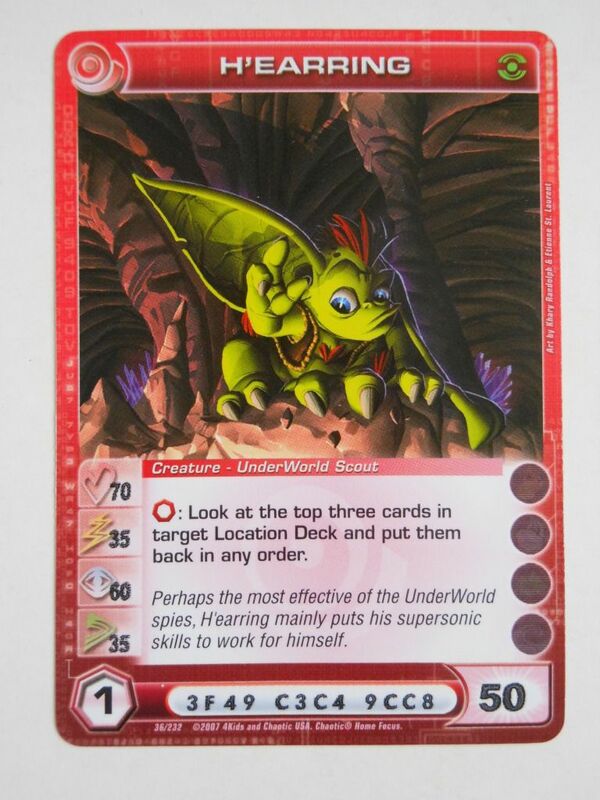 Chaotic - OverWorld starter deck. 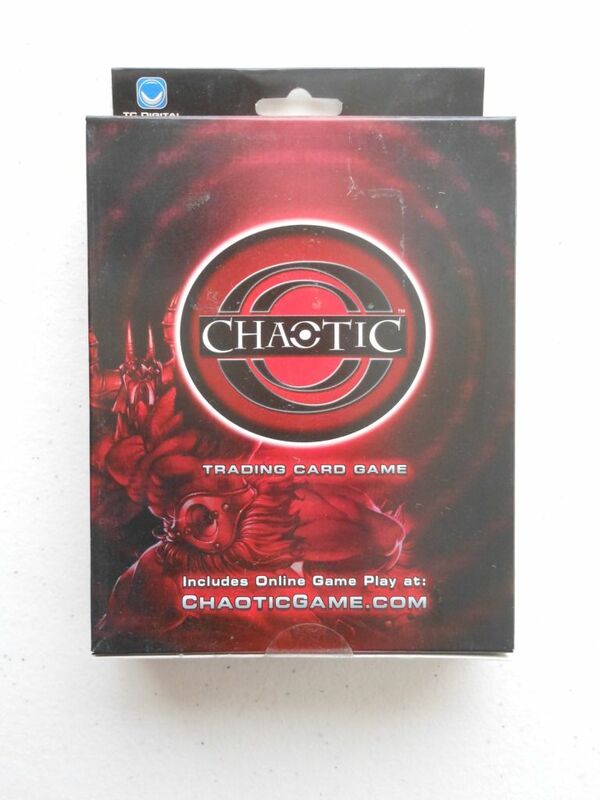 Chaotic - UnderWorld starter deck. 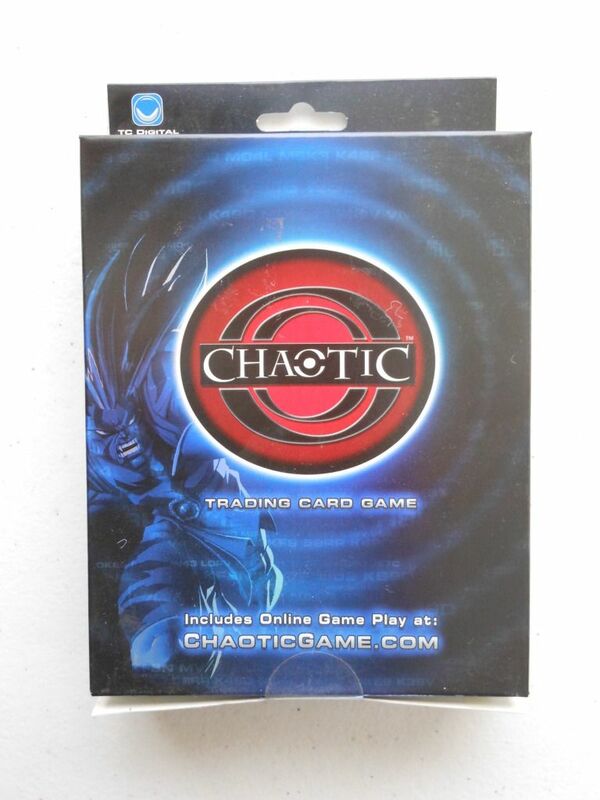 These are the two starter sets (OverWorld and UnderWorld) for the out of production trading card game, Chaotic. You would think, after picking up Gormiti: The Trading Card Game, I would have learned my lesson about buying card games in Poundland, but no. I guess I'm just not that smart. Besides, each set was only £1. Both boxes claim you can play online, but of course, Poundland don't stock anything that isn't crap or discontinued (usually both), so it came as no surprise to find out the game was cancelled in 2007 and the website has been closed down. Still, it might be a good game, right? Nice picture... Shame about the name. What annoys me the most is that each fixed starter deck was bundled with four randomly allocated rare foil cards; but I managed to get an identical set of four foil cards in each of my starters, which brings into question the random distribution method that was used. Actually, that's not true. What annoys me the most is that magic in this game is called "mugic," because the magic is generated through music (get it?). That's the kind of thing that makes me want to set fire to the cards. Fear not; there will be a review as soon as I find the strength to play the damned game. Dungeon Command - A New Addiction?